Hi, when I first tried this recipe, everything worked out. Now I try the second time, I do everything the same way and use the culinary scales to measure the exact weights, but for some reason this time at the kneading stage the dough remains very sticky. In your video, after the first 10 minutes of kneading and stretching, the dough does not stick to the table, but I can hardly separate it with a scraper from it. What can I do in this case? Add some flour? Hello Ogre, I appreciate your patience on my response to you. I was away on holiday. 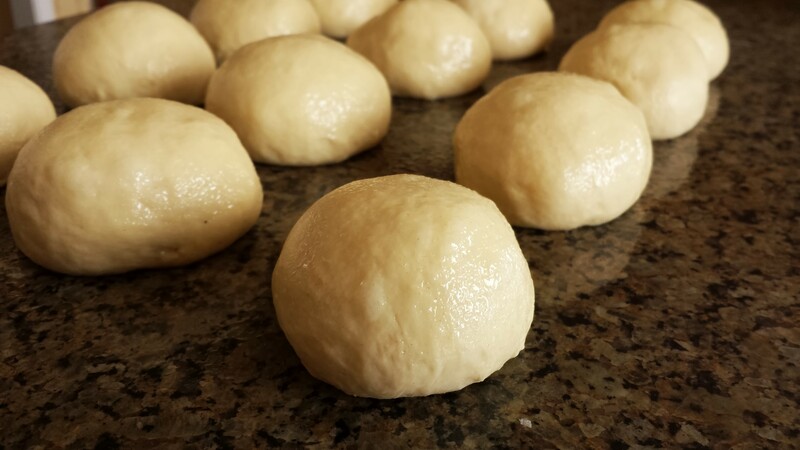 Because of the higher hydration and fat content of the recipe (this is what makes the buns so soft), the dough will remain sticky throughout the kneading process when either mixing by hand or by machine. It is great you achieving the windowpane test this show that the gluten is well developed in the dough even though it is sticky. What I have found to be helpful is to stop kneading after 6 to 8 minutes and cover the bowl with a damp towel or plastic wrap and let the dough rest for at least 20 minutes This allows the flour to fully hydrate making for a dough that will seem less sticky and will develop strength when you return to finish kneading. This technique is a modified autolyse. As you continue to ferment and folded the dough you will find it will become stronger and less sticky. I have found over the years sticky doughs can be the most challenging experience my students can have. They often ask why the dough I’m demonstrating isn’t sticking to my hands or the table while theirs is. It all has to do with experience. You’ll find the more you make this recipe the easier it will be to handle. Please let me know if you should have any other question I may help you with. Thank you for taking the time to ask your question. Have a great day! hey thanks for the recipe .. can leave the mix overnight Before making them round? Hello Nadine, Yes, You can take the recipe to Step 12 in the recipe and then place the dough into the refrigerator overnight. Make sure the dough is cover well so it doesn’t dry out. The next day you use the dough directly from the refrigerator and pick up the recipe with Pre-shaping, Final Shaping, and Proofing the buns. Note, the final proofing of the buns will take longer since the dough will be colder than room temperature. Please let me know if you have any other questions I may help you with. Thank you for writing and Happy Baking! hi we can make them also with mixing bowl electric like if we are doing bread .. not mandatory to make with hands ?? Hello Barka, Yes, feel free to use a mixer with kneading attachment. Mix on low speed for 4 minutes and then on medium speed for 6 to 8. Please let me know if you have any other questions. Thank you and Happy Baking! Try placing the tray further from the bottom of the oven, (a higher shelf) or using convection cycle if your oven has that, or place an empty tray on the shelf below the buns to deflect direct heat. Or, use a light colored aluminum airbake tray. Also, check the temperature of your oven with a thermometer at the top and bottom, sometimes it’s very different. Or, sometimes adding parchment to the tray helps. Hello Edward, use the t65 flour for bread. Please let me know if you have any other questions.